The shaft of the cross is bordered by a wide outer cable and fine inner roll moulding. 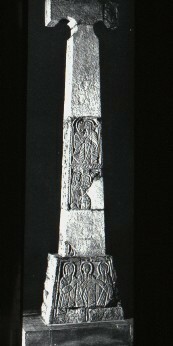 The shaft of the Cross has two scenes with figures on it. The upper one has angels, or possibly an Annunciation scene with the angel and Mary: New Testament, Luke 1:26. The lower panel has a Crucifixion scene. This may be the Crucifixion of Christ or possibly that of Andrew, described in the Apocryphal Acts of the Apostles. The figure is bound to the cross. There is a figure on either side of the cross, the one on the left is thought to be a woman. There is another figure below the one on the left, but only part of his head and one hand survive. He is possibly holding a squarish object. The front of the base of the Cross has three figures on it. The one in the middle is frontally posed while those on either side turn slightly towards him. These figures are thought to be Apostles. The central figure carries a book in his draped left hand and the two first fingers of his right hand extend across his chest.